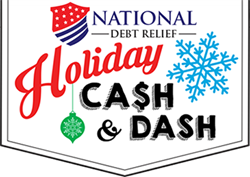 National Debt Relief’s Holiday Cash And Dash Sweepstakes will run from Black Friday, November 24, 2017 to Saturday, December 23, 2017. National Debt Relief will be giving away over $20,000 and over 150 cash prizes! Over the course of the sweepstakes, National Debt Relief will be giving away over $20,000 in cash prizes! This year, National Debt Relief will host a Holiday Cash And Dash Sweepstakes starting Black Friday, November 24, 2017 and ending on Saturday, December 23, 2017. Over the course of the sweepstakes, National Debt Relief will be giving away over $20,000 in cash prizes! National Debt Relief works all year long to help Americans struggling with credit card debt. They’ve helped thousands of clients achieve debt relief with a tried-and-true strategy that has earned them an A+ rating with the Better Business Bureau and over 10,000 5-star reviews across dozens of review sites. This holiday season, National Debt Relief is taking their relief efforts one step further through the Holiday Cash And Dash Sweepstakes by giving away prizes that can go a long way towards getting rid of someone’s debt. Participants may enter the sweepstakes by clicking here, where they will be asked to spin to win – prizes include gift cards up to $250 and a grand prize of $10,000. While participants will enter for the grand prize once, they can come back daily to spin to win. Extra entries towards the grand prize can be earned by sharing about the contest on social media and by answering a few bonus questions. Click here to play National Debt Relief’s Holiday Cash And Dash Spin-to-Win Sweepstakes now.